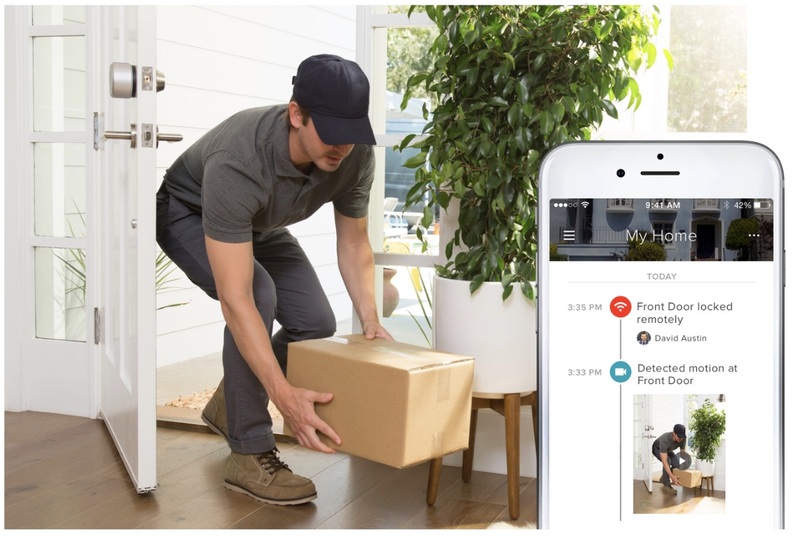 Today at CES, smart lock maker August announced the expansion of its in-home delivery service "August Access," which will roll out in partnership with delivery company Deliv. Similar to Amazon Key, customers who use August's service will grant Deliv drivers one-time access into their home so that packages aren't left outside (via TechCrunch). August's service will expand upon its previous August Access platform by opening it up to any interested online retailer, allowing users to order products from these stores and select the August Access in-home delivery option. As long as customers have smart locks from August, Emtek, or Yale, August will then generate a one-time password that the Deliv driver enters, drops off the package inside, and closes the door on their way out (which re-locks automatically). Once the process is complete users will get a notification on their iPhone or Android smartphone, and the company will also offer "a camera feature" to see the delivery live or watch it later. No information was given on what security cameras will be supported with the service. Besides August locks, the Emtek and Yale brands are supporting August Access now that each company is under the Assa Abloy umbrella, following its acquisition of August last year. The service was previously tested with Walmart in September, even allowing delivery people to put away groceries in customers' refrigerators when needed. Amazon Key works in much the same way as August Access, allowing Prime members in 37 cities across the United States to order "tens of millions of items" on Amazon.com and have them delivered securely inside their home. But August CEO Jason Johnson said August Access provides more "choice and flexibility" since it's not only available to products on Amazon but will be supported by any retailer who decides to back the platform. Nervous about a single package getting stolen? Now, you can be nervous about everything in your home getting stolen. August Access: Trading one fear for another. Yeah I don’t think so!! Even with security cameras on the residence, there is just something uncomfortable having a complete stranger having access to your house, even if they were honest or not. It's the unfamiliarity of who it is and any unknown intentions. I’m not sure who is more naive: them for thinking people would be that trusting or the person who actually signs up for this. Yeah, hackers have already figured out how to circumvent the Amazon version of this service. They essentially are able to make the indoor camera freeze on a frame where it looks like they've left, then go back in entirely undetected. There's just way too many ways to game a system like this. Sorry August, nice try!